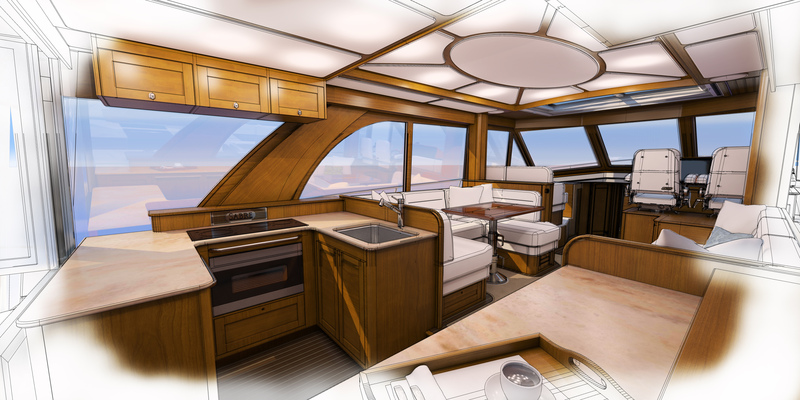 Galley location in each new model has been a focal point of Sabre Design Team meetings throughout our nearly 50-year history. The aft-galley in the new Sabre 58 Salon Express is at the heart of the social space, mirroring the feel and flow of modern home design. After consulting with our clients, many of whom are experienced cruising couples on their second or third Sabre, we shook up the layout in the Sabre 58. Customers are asking for the same welcoming social environment they feel in their home kitchens. They want a galley that acts as a center of activity, whether they are entertaining company, or enjoying a peaceful evening together. The Sabre 58’s galley-aft layout effortlessly joins the exterior cockpit space with the elegance and comfort of the main salon, emphasized by the fully opening main door. It creates a more symmetrical main salon, wherein opposed seating encourages conversation and comfortably facilitates a formal meal. On the lower deck, it allowed us to create, as standard, three staterooms, each with their own en-suite head compartment. The layout in the new Sabre 58 isn’t what folks are used to seeing in our boats. Some may consider it bold: we consider it keeping up with the modern owner.